This post was supposed to be about holiday book giving....except that Hanukah ended Saturday night, and unless you live near the world's best stocked indie bookstore (or don't mind paying an arm and a leg for expedited online delivery), it's a little late for holiday book shopping. Not only that, but in my last post on the topic, I think I expressed my unease in recommending books for you to give. You know the reading ability and taste of your book recipient. I don't. In fact, I would never give a book that I hadn't read myself. So in the interest of informed book giving, here's a list of my favorite books published in 2012 that you should read. This way you'll be prepared for book giving the rest of this year. This is a real quirky list, guided only by my own reading tastes. I hope there's at least one book here that will ring your holiday chimes. 1. Code Name Verity by Elizabeth Wein. Two English girls find themselves in the middle of Nazi Occupied France with a mission to accomplish. Mystery, intrigue, told from a double POV, this one was a real nail biter. This is available in every format you can imagine, including MP3 downloads and Audio Book. 256 pp. 2. We've Got a Job: The 1963 Birmingham Children's March. When I was researching Yankee Girl. I was surprised to find how little had been written about this chapter of Civil Rights history. The arrest of 4,000 elementary through high school students, peacefully protesting inequality in Birmingham , Alabama is a story that I incorporate in my school visits...and that my audiences have a hard time believing. This account focuses on four of the participants and their lives before, during and after the march. This is not available electronically, although it is on audio CD, and on Audible Audio. 176 pp. 3. Never Fall Down by Patricia McCormick. This is based on a true story of an 11-year old Cambodian boy who survived the Killing Fields by playing music for the Khmer Rouge. McCormick does not spare the harrowing details in what is ultimately an uplifting story. Available one-book and Audible Audio. 2. Wonder by R.J. Palacio. Fifth grader Auggie Pullman has such a severe facial deformity that he has been home-schooled. . .until now. Beginning with Auggie's POV, the story then switches to that of his classmates, his sister, her boyfriend and others, culminating in a Big Picture of a community struggling with compassion and acceptance. Available in e-format, audio CD, Audible Audio. 320 pp. 3. Titantic: Voices from the Disaster by Deborah Hopkinson. Just when you think you have read everything there is to read on this subject, Hopkinson unearths first person accounts and archival pictures (taken by a passenger who got off at the last port before before the sinking). Guess what James Cameron got everything right! Although this is avail be in e-book, audio CD and Audible Audio, I would recommend the hardcover for the clarity of the pictures. 304 pp. 1. And Then It's Spring by Julie Fogliano, ill. by Erin Stead. Illustrated by last year's Caldecott winner, a boy and his dog, tired of winter, decide to plant a garden. But first ....there must be spring. 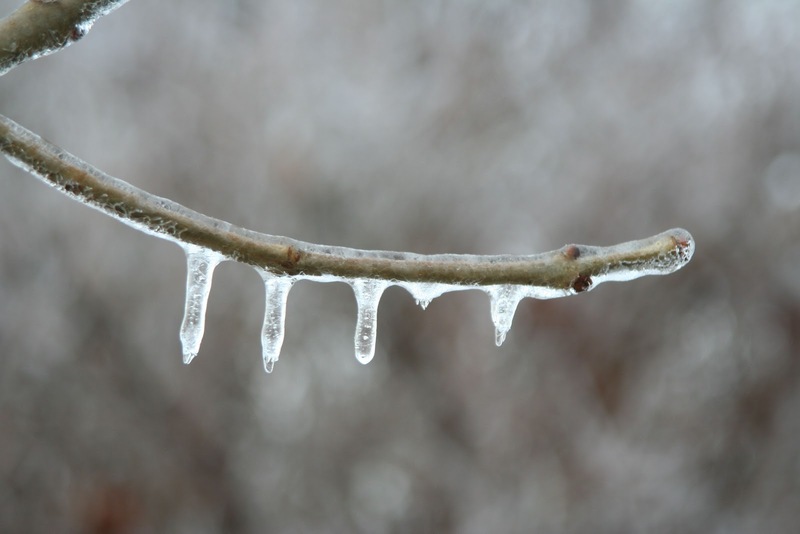 Any kid who has lived through a winter that lasted just a little too long will identify with this one. 2. Olivia and the Fairy Princesses by Ian Falconer. Olivia, that precocious piglet, is up to her snout in princesses. In the sparkly-pink world of princessdom, how can a pig who prides herself on individuality, make her mark? IMHO, this title is the best of the Olivia series (possibly because I too, am tired of sparkly=pink princesses.) Available in e-book. 3. Green by Laura Vaccaro Seeger. How many kinds of green are there? More than you could ever imagine, as this concept book proves. This is a title to sit and savor, over and over. Hardcover only. Here are some more titles I liked. In addition, two of my all-time favorites, Kevin Henkes and Rick Riordan have new titles this year. I didn't include them because these two guys have yet to write a book I didn't love. Everything by them is great! And if for some reason you haven't read Charlotte's Web (the movies do not come close to the book), now is the time. 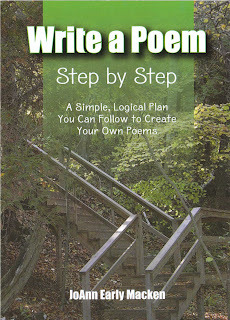 Don't forget to enter our Book Giveaway for JoAnn Macken's How to Write a Poem Step by Step. See JoAnn's guest post for details. Howdy, Campers ~ Happy Poetry Friday! ...and if it's at Jama's it's sure to be tasty! 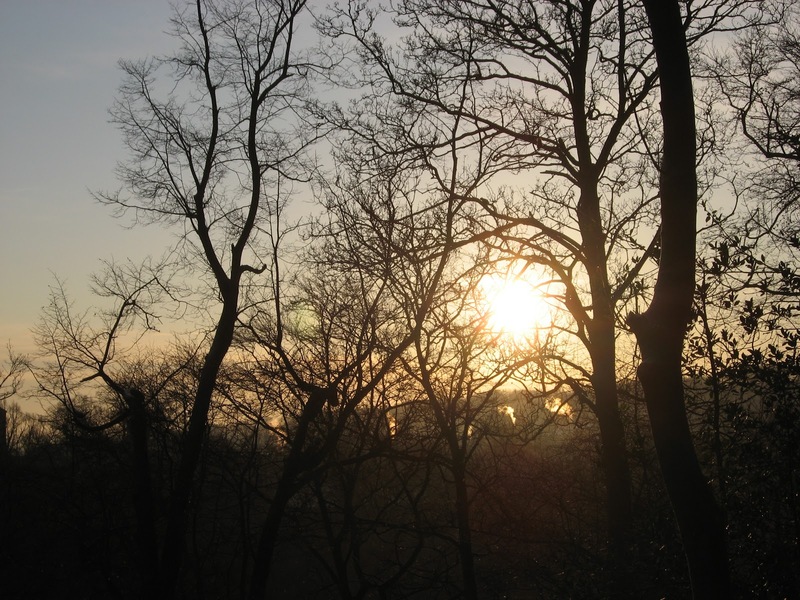 for the solstice inspired this post. 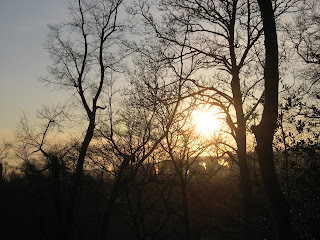 I've been thinking about my family and our, well, interesting year (especially the part about my husband dying of a heart attack and being brought back and now being completely and miraculously fine); about hard times and hope, about sunrises, candles, glowing kitchen windows at night, and about the dark of winter and the glint of winter sunlight. Sun, oh, Sun, where do you disappear? Look around, little girl, I am here, I am here. I am Jewish; I just recently learned that the fifth night of Hanukkah (which can be spelled many ways) is the first night in which there are more flames than darkness, more candles lit than unlit, and represents the triumph of light over darkness. Okay...ready for today's writing workout, Campers? 1) Take a cozy moment to scribble ten ideas triggered by the phrase, "a light in the darkness" or by the 1:06 minute video above. Jot down memories, images, or the name of someone in particular who helped light your way in a dark time. 3) Or write a 100-word story. 3) Or write forget #2 and #3 and write the poem or story you were meant to write today. 4) Write like a little kid who is so jumpy-excited to get a piece of paper and a pencil she can barely sit still. Give that little kid a chance; let's see what gift she creates for you this holiday season! And speaking of gifts, don't forget to enter to win a gift for yourself or for some lucky teacher in your life: an autographed copy of JoAnn Early Macken's, Write a Poem Step by Step. I have her book and it's terrific! 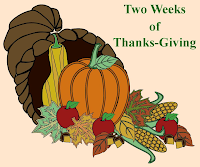 See JoAnn's guest post for details. 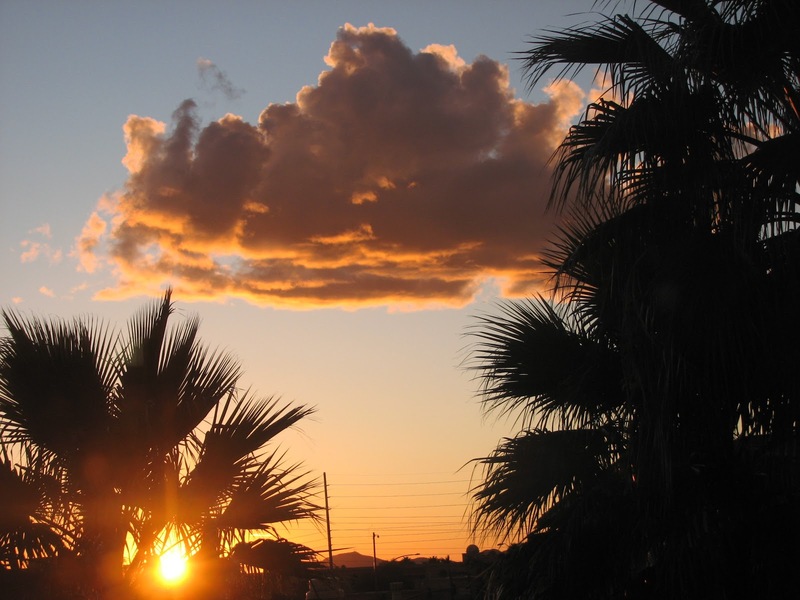 but in Phoenix, several years ago. Most of the adults who sign up for my writing classes have the same goal: to get a book published by a traditional publisher. They're usually shocked to learn what a long, slow process book publication typically is, whether they're working on a picture book or a novel. To help cope with the wait, I recommend they work on building a portfolio of writing credits they can mention in their cover/query letters. On Monday, Esther shared links to information on how to get published in Highlights magazine. Highlights is a well-respected magazine that's been around for years, and an impressive credit to include in your writing portfolio. Unfortunately, that means they receive a huge volume of submissions, making them a tough market to break into. I like to remind my students that there are other children's magazines, many of them more open to material than Highlights or the Cricket Magazine Group, which publishes high-quality magazines for toddlers to teens. 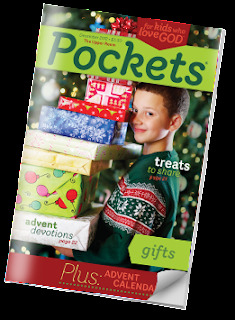 One of my favorite lesser-known children's magazines is Pockets, published by The Upper Room, for 6 to 12-year-olds. Like Highlights, Pockets runs an annual fiction contest. They also accept a variety of material, including fiction, nonfiction, poetry, puzzles, and activities. Although Pockets is a Christian magazine, not all content is explicitly religious. I recall studying a sample issue years ago that happened to include a story that had won their fiction contest. It was a wonderful story about a girl learning to accept her new stepfather. I don't believe it mentioned God at all. "Each issue is built around a specific theme with material that can be used by children in a variety of ways. Submissions should support the purpose of the magazine to help children grow in their faith, though all submissions do not need to be overtly religious." Of course, the key to success when writing for Pockets or any other magazine is to study several issues so that you can draft a submission that fits with the magazine's overall feel. You should be able to check out copies of well-known magazines like Highlights and Cricket at your public library. For smaller magazines like Pockets, you can usually request a sample copy from the publisher. Instructions for doing so are often listed in the "Magazines" section of the annual Children's Writer's & Illustrator's Market (Writer's Digest Books). You may be surprised by the number and range of magazines you'll find listed there. If you're a member of SCBWI, you can also download the latest SCBWI Magazine Market Guide, which also includes general tips on writing for magazines. Besides magazines, another good market for building your writing portfolio is the Chicken Soup for the Soul series of books. Their upcoming titles are listed on their website along with their submission deadlines. (Remember: Deadlines are our friends!) When Chicken Soup put out a call for the book Teens Talk High School: 101 Stories of Life, Love, and Learning for Older Teens, I submitted a poem in two voices called "Questions," which they accepted. My Writing Buddy, Leanne Pankuch, recently had her second Chicken Soup story published in Hooked on Hockey. Again, to place a story in a Chicken Soup book, it's important to study past issues, and also to carefully read their guidelines. While Chicken Soup stories are nonfiction, they must read like well-crafted fiction--with a beginning, middle, and end; action; dialogue; conflict, a theme, etc. By the way, all the markets I've discussed today pay for your writing. While it's not exactly a "pot of gold," receiving payment for our work is affirming. And it has given many of my former students the confidence to say "I am a published author," even as they wait for their first book contract. Don't forget: there's less than a week left to enter for a chance to win an autographed copy of JoAnn Early Macken's, Write a Poem Step by Step. See JoAnn's guest post for details. 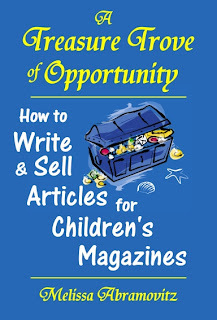 As reported in my December 5 post “Good Ol’ Opportunity,” in which I offered my Thumbs Up review of Melissa Ambramovitz’s guide to writing nonfiction children’s magazine articles, A Treasure Trove of Opportunity, a multitude of publishing rainbows besides those first sought await children’s book writers on their road to publication. 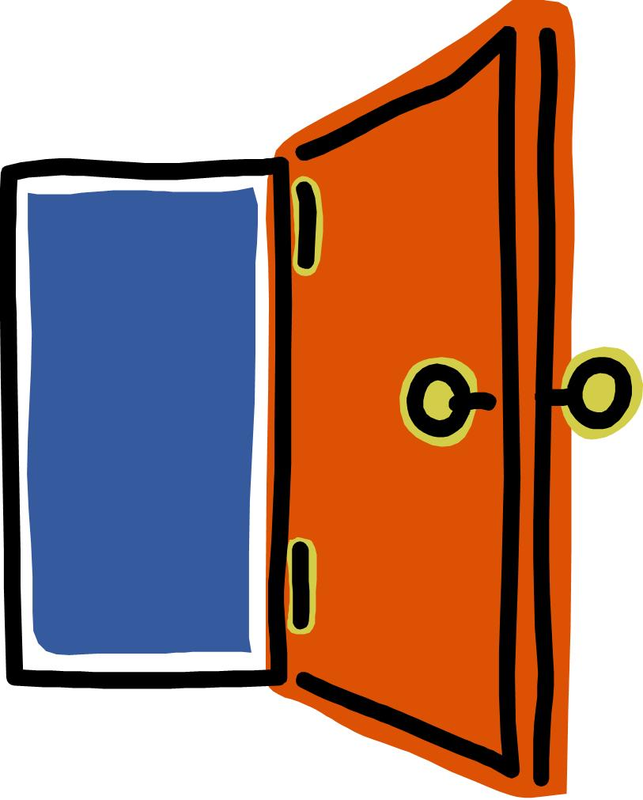 In other words, Opportunity knocks often and loudly in the Children’s Book World. 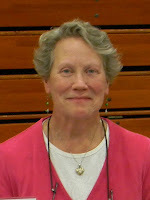 This coming year, the judges welcome stories of any genre (mystery, historical fiction, sports, humor, holiday, etc.) as long as the stories are intended for kids ages 6 to 8. Three prizes of $1,000 or tuition for any Highlights Founders Workshop will be awarded. Entries must be postmarked between January 1 and January 31, 2013. This is the perfect follow-up to PiBoIdMo. Participants will be encouraged to write one picture book draft a month, for 2013’s twelve months. You’ll receive support, motivation and accountability, not to mention insights and instruction from authors, illustrators, editors, art directors and agents. Please note: NaNoWriMo participants can continue learning at the challenge's blog. Be sure to check back for the first TeachingAuthors post of the New Year when we offer our readers yet one more opportunity to work their writing muscles throughout the coming year. Good Luck! – and – Happy Holidays! Don’t forget our TeachingAuthors autographed Book Giveaway of former TA JoAnn Early Macken’s newest, Write a Poem Step by Step: A Simple, Logical Plan You Can Follow to Write Your Own Poems. To enter our drawing, you must follow the TeachingAuthors blog. If you’re not already a follower, you can sign up now in the sidebar to subscribe to our posts via email, Google Friend Connect, or Facebook Network blogs. You may enter the contest one of two ways: 1) by posting a comment below OR 2) by sending an email to teachingauthors [at] gmail [dot] com with "Book Giveaway" in the subject line. Whichever way you enter, you MUST give us your first and last name AND tell us how you follow us (via email, Google Friend Connect, or Facebook Network blogs). If you enter via a comment, you MUST include a valid email address (formatted this way: youremail [at] gmail [dot] com) in your comment. Be sure to tell us about a book that influenced your own teaching or writing. This contest is open only to residents of the United States. Incomplete entries will be discarded. The entry deadline is 11 p.m. (CST) Tuesday, Dec. 18, 2012. I'll announce the winner on Wednesday, Dec. 19. Good luck! I used to be a regular contributor here at TeachingAuthors, but now I am a guest. In my last post, I explained my difficult decision to step away from the blog because of an overwhelming workload. Now my busiest teaching semester ever is coming to a close, and I have a new book to celebrate. Hooray! Write a Poem Step by Step: A Simple, Logical Plan You Can Follow to Write Your Own Poems evolved from the poetry workshops I’ve been presenting in schools for the past fifteen years or so. Poems written by students in my workshops illustrate each step in the process. 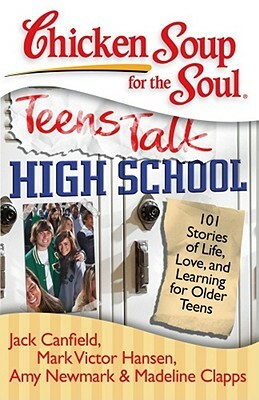 I’m delighted that the TeachingAuthors have invited me back to tell you about it and to give away an autographed copy. A Celebration of Bees: Helping Children to Write Poetry by Barbara Juster Esbensen was an even bigger influence on my developing teaching/helping techniques. I took her words to heart: “If any one word can stand for the essence of creating a climate, an atmosphere that allows the creative impulse to grow and flourish, I think it would be the word accepting. Every child needs to feel that you respect and accept what he or she is trying to do.” I also latched onto her practice of asking questions to draw out children’s own ideas. With those concepts in mind, I’ve developed and fine-tuned my own approach to working with student poets over the years. What I wanted from the start was a method students could follow all the way through the process of writing a poem. I didn't want to give them a form to fill in; I wanted them to find their own way, step by step. That process is at the core of Write a Poem Step by Step. is wearing my jacket and shoes. Write a Poem Step by Step is available now from Lulu, amazon, Barnes & Noble, and bookstores. You can read more about it on my web site. Enter the Book Giveaway for a chance to win an autographed copy! 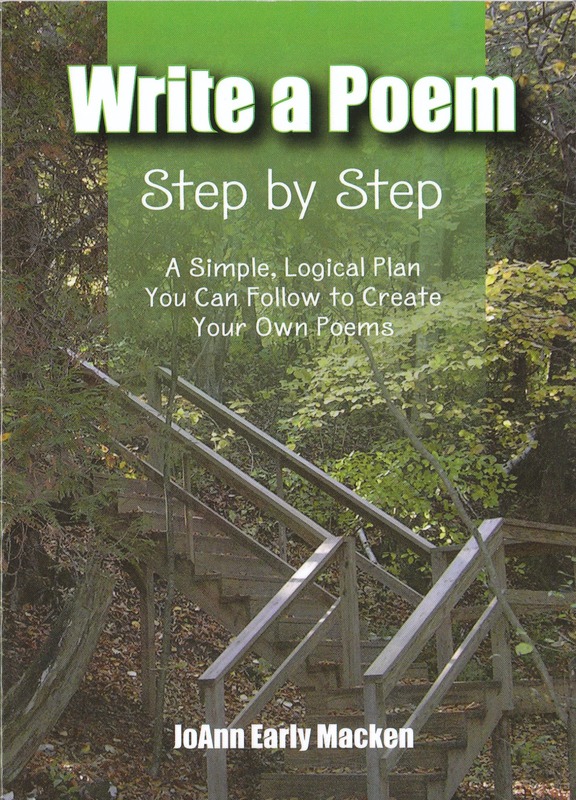 For a chance to win an autographed copy of Write a Poem Step by Step: A Simple, Logical Plan You Can Follow to Write Your Own Poems, tell us about a book that influenced your own teaching or writing. It's Poetry Friday! Today's Roundup is at READ, WRITE, HOWL. Thanks to more years on task than I’d ever imagined, I’m personally acquainted with the proverbial carrot that swings beneath our writers’ noses whilst we bravely and anxiously navigate our Writer’s Journeys. We travel here, there and everywhere, despite unrewarded efforts, creatively visualizing our stories when printed and bound, covered and blurbed – in other words, published. If we stop for a second and look around at our Children’s Book World, a multitude of publishing rainbows are there for our viewing before we reach our wished-for, worked-for destination. 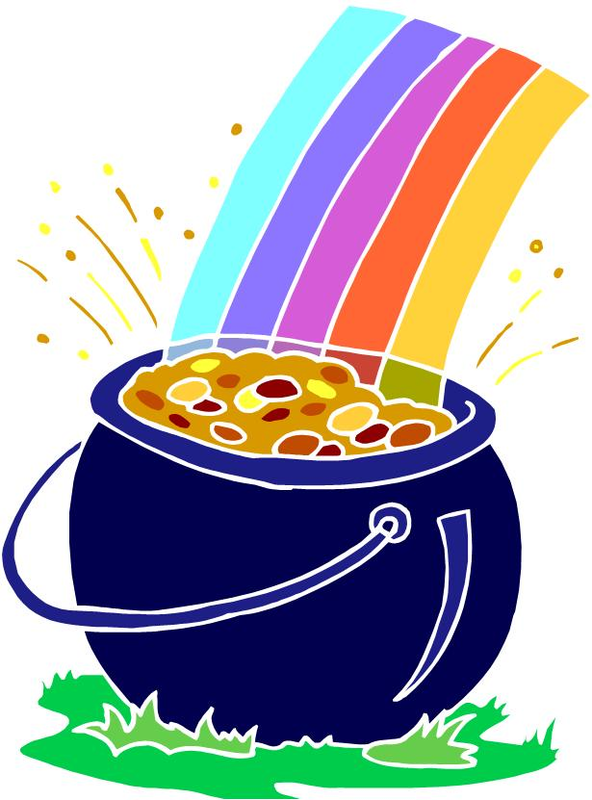 Each offers its very own pot o’gold, an opportunity to achieve publication and thus experience pride, satisfaction, affirmation and sometimes even $$$. There’s a treasure trove of opportunity awaiting us writers, besides the one we first set out to capture. For instance, what about writing fiction for children’s magazines? Or what about writing nonfiction articles for educational publishers? Even better, what about writing nonfiction children’s magazine articles?! 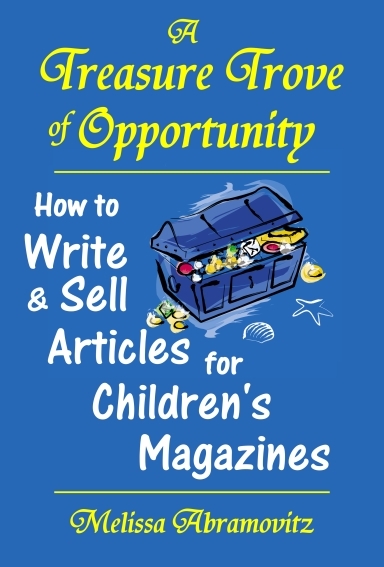 Thanks to Melissa Abramovitz’s Thumbs-Up guide, coincidentally (and appropriately) titled A Treasure Trove of Opportunity: How to Write & Sell Articles for Children’s Magazines (E & E Publishing, 2012), we can now put our writing skills, interests and talents to work mining other paths to publication. There is indeed a market for nonfiction children's magazine articles. Melissa knows all about writing – for all age groups, from preschoolers through adults. 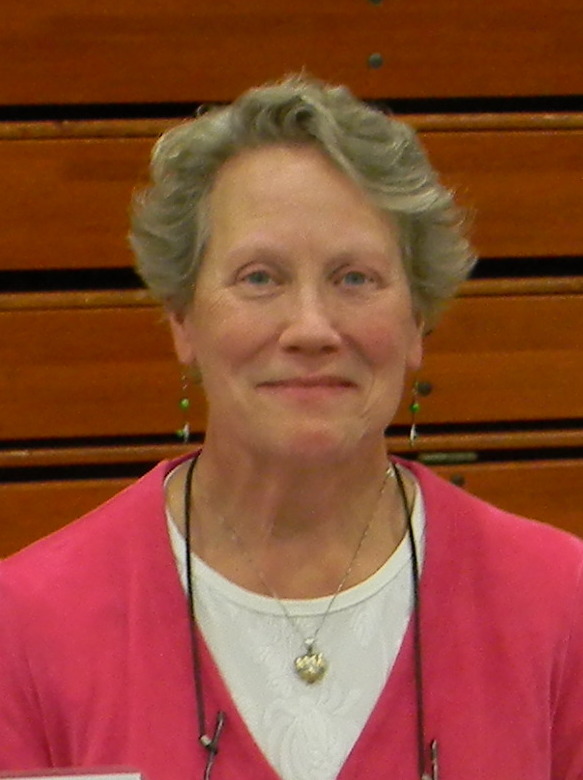 Her publishing credits include educational books on health topics, as well as science, nature and history, fiction, poetry and five rhyming picture books. But she especially knows all about writing nonfiction magazine articles. In this one-of-a-kind resource based on her twenty-five years of experience and extensive body of work, as well as interviews with other nonfiction magazine writers and editors, she generously shares insights she’s gleaned, proven tricks of the trade and the tools she uses to move from generating ideas to researching to structuring, on to creating whole pieces, formatting and revising, on to querying likely publishers, considering contracts and marketing your work. Concrete learner that I am, I was especially taken with Melissa’s “Show, don’t tell” examples when making a point. She shares her own published articles as well as those of others. She offers the nitty-gritty details - of referencing references, photo inclusions, author rights, and nailing a story’s audience, just to name a few. Her listing of “salable structures” sparked all sorts of ideas: How-to articles, puzzles, quizzes, sidebars, nonfiction verse, personal experience articles, slice-of-life or inspirational articles, profiles and as-told-to articles. 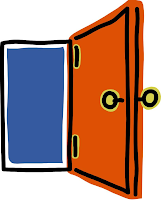 Appendix A: Grammar Gateway even offers tips on sentence structure, spelling, punctuation and unbreakable rules – good for any writer, no matter the format, genre, audience and publishing segment. 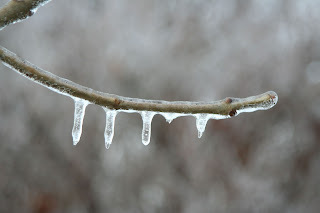 Consider this post, consider Melissa Abramovitz's book but one knock at your Writer’s Door. The season of gift giving is here, and I know what all of you TA followers want...a book. Right? 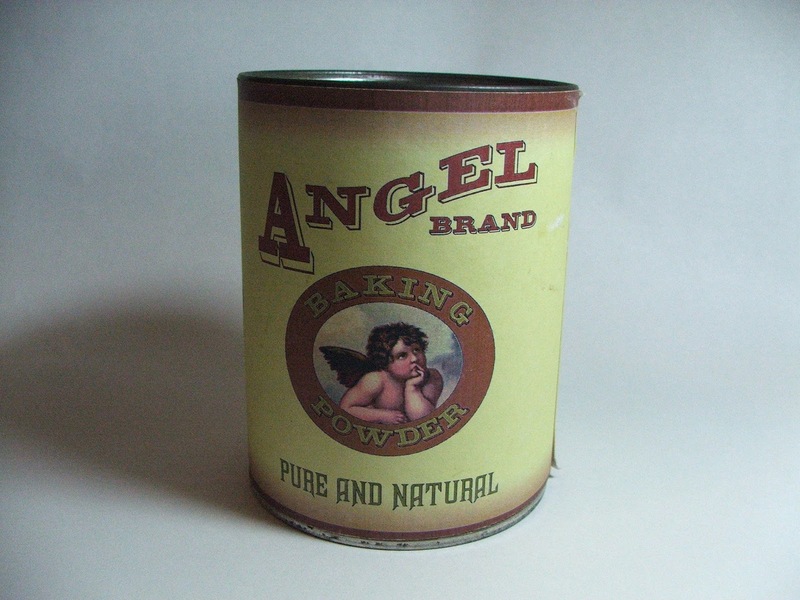 And what is our go-to gift for the loved ones in our lives? A book. I learned early that those square packages that didn't rattle when you shook them were either underwear or a books. A solid thump would eliminate the former and affirm the latter. No matter what other presents I received, Christmas afternoon would find me curled up with my gift book. My beloved Charlotte's Web was a gift from my father when I was eight. A biography, You Might as Well Live, my junior year of high school began a life long love of Dorothy Parker. My dad was the book giver in my family. He somehow knew just the right book for me, and what I had already read. I suppose I should not have been surprised since he was an FBI agent with excellent powers of observation. Holiday giving was pretty easy at my house. Both of my parents were non-fiction readers whose tastes ran to non-fiction, particularly political history and biography. They never read fiction. Christmas at my house was books, books and more books (and, from my ever-practical mother, underwear). When I had a child of my own, I felt blessed that she loved books as much as I. Every gift giving occasion included at least one new book, that her father or I would read to her. Then my daughter was diagnosed as severely dyslexic. While her own vocabulary and understanding of what was read to her was far beyond her grade level, what she could actually read for herself did a number on her self-esteem and willingness to persevere. While everyone in her class was reading Harry Potter, my daughter could not read the picture books that I had written about her. It was a frustrating situation, since she still loved books and stories. Maybe you have a reluctant reader or one, who like my daughter, has so much difficulty reading that it is an ordeal rather than a pleasure. 1. Magazine subscription--My husband swears that the only reason he ever read as a child was that his parents gave him a Sports Illustrated subscription every year from third grade on. My dad, the Wizard of Gifts, didn't miss a beat when he learned his granddaughter would never be a reader. He added up her love of nature, travel and her talent as a photographer...and renews her subscription to National Geographic every Christmas. Today, Lily is a National Arts Honor Student in Photography. Her career goal? To be a National Geographic photographer, of course. As for e-magazines, it would be easier to list those not available electronically. You can download a subscription to everything from Sesame Street to Seventeen to Sports Illustrated. One word of caution. Picture books derive much of their meaning from their arrangement of pictures and text. Even though there are a number of picture books that are available in e format, the print to screen layout is not always the same. There are books designed specifically as e books (Lulu's Brew by Elizabeth Dulemba immediately comes to mind.) The same is true of verse novels and books of poetry. As much as I love Ellen Hopkins' YA novels, a great deal of their meaning is derived from the way the verse is arranged on the page...something which does not always turn up in the version. 3. Audio books--I love being read to. So does my husband. When we were first married and our car did not have a tape player, I would read to him on long car trips. You know you are in love if you are willing to spend an 18 hour car trip reading a corporate history of the Anheuser-Busch company, aloud. By the time our daughter came along we had upgraded to cars with tape and then CD players. We made a lot of long car trips. Enter the audio book. Both Lily and my husband ( see item one) enjoyed hearing Henry Huggins, the Ramona books, The Chronicles of Narnia, and the Percy Jackson Series. Two words of wisdom in buying reading material for anyone. One...if you don't know the person well enough to know they will be interested in your gift selection, don't give a book. If you have to ask a bookseller, "What are 12-year-olds (fill in the appropriate age) reading?" then you don't know this child well enough to give them a book. I learned this the hard way from my husbands nieces and nephew who were not readers. For years they would open my present with a fake smile and an unenthusiastic "Oh, it's a book." I also have observed the wrath of some parents whose child was given "what 12-year-olds are reading," (usually by a grandparent), only to find that the parent found the book inappropriate. When in doubt...give a gift card to their local (independent, if possible) bookseller. Two...just because you loved a book doesn't mean your child will. The only audio book that was spurned by both Lily and my husband, was Charlotte's Web! Sigh. It happens to the best of us. Happy (book giving) holidays, one and all.